Former Gov. Tommy Thompson — Wisconsin's longest-serving governor — has written a memoir disclosing his career's highs and lows. 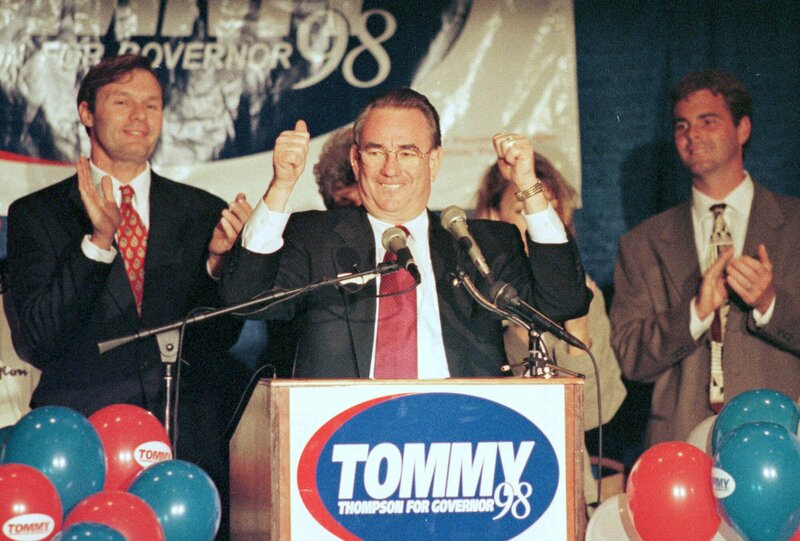 "Tommy: My Journey of a Lifetime" chronicles more than four decades in politics, including 17 years as the leader of Wisconsin. The 76-year-old, who served as governor from 1987 to 2001, told WPR's "The Morning Show's" Carrie Kaufman that there may even be room for one more campaign in his career. "There's always a burning fire inside of me, especially during election time right now that I think I should be on the ballot and I think I should be running," Thompson said. "I still think there's one more campaign in me that I would like to run." Carrie Kaufman: Where did this passion for politics start? Tommy Thompson: The passion started in my father's little country grocery store where I had to work. My father was the chairman of the road and bridge committee for Juneau County and the locals would come in — we'd have some beer and some liver sausages of fresh ground beef — and sit around and discuss the county. I just loved the wheeling and dealing at a very young age of these individuals who would come in and try to do what was the best for the county. My father tried to manipulate and figure out how to reach a consensus. It was just fascinating for a young individual like me, and I think that started my quest and desire. CK: You made it plain that you wanted to be governor pretty early on in the Legislature, but you waited 20 years. What made you wait? TT: You have to build your reputation, your resume. You also have to be able to get around the state and meet people. I had no money and didn't have any chance of getting the big money to run like you do today in politics. The only way I knew I could win is by building an organization county by county and be able to have people in each county that really liked and respected me that would work like me — not quite as hard as I did — but work to build it. And that's why it took a long time. I knew I couldn't advertise. I knew I couldn't get on television. And with this face you know television probably is not too kind. So I had to do it by sheer elbow grease and foot leather and getting people organized. That's why it takes some time and I was able to do that. CK: I want to move to what you call the headline grabber of your governorship: welfare reform. This was something you put in your first budget and it caused quite a stir at the time. Talk to me about this. TT: Wisconsin was a magnet state for people on welfare coming up from all over. They used to have signs in Chicago the bus depot — I never saw them personally — but I heard a lot of that. If you spend $25 for a bus ticket, you can go to Wisconsin, sign up for welfare, get your check every month and go back and live in Chicago. Wisconsin was being taken advantage of and people were very frustrated. Welfare benefits were higher than in the surrounding states. And as a result of that people were coming in here to get on welfare. CK: Do you have anything that you wish you had done differently in terms of welfare? TT: No. I was very generous. What I did is something nobody else has ever done. I called welfare recipients to the executive residence and had lunch with them. The people that really helped me support and get welfare reform were welfare mothers who came in and had lunch with me. I wouldn't let them bring anybody else but themselves. And I wouldn't bring in any of my assistants. I just sat down with welfare mothers and talked about why are you on welfare. What can we do? And that's how we really constructed welfare reform. CK: You said that school choice was one of the hardest fights and most satisfying accomplishments of your time as governor. Why? TT: If you started out as a freshman black student in Milwaukee, about 60 to 65 percent of those would not graduate. I thought what a waste. And so I went down and talked to a lot of the black ministers in Milwaukee and a lot of parents and I said, "What's wrong?" 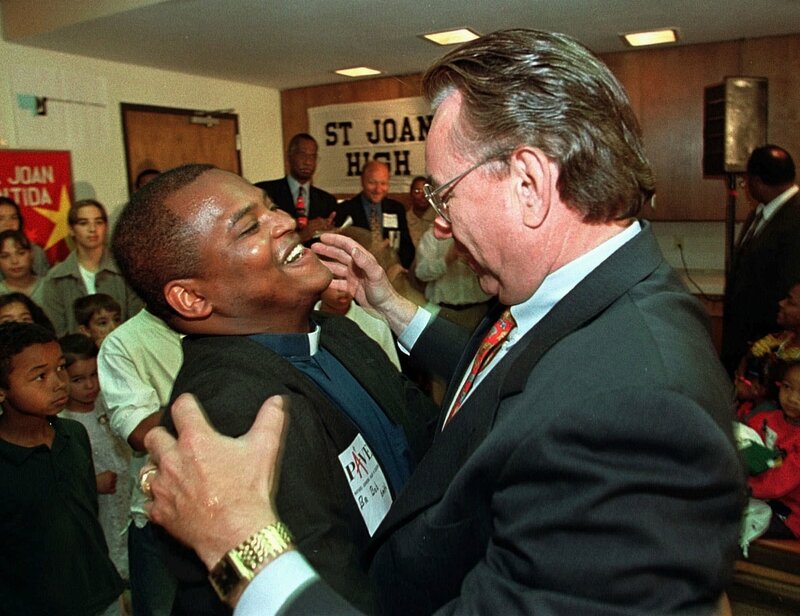 They said, "We're sick and tired of busing our children from the inner cities in Milwaukee out to the suburbs." Why can't we send them down to the school right down the block and it may be a Catholic, Lutheran or a non-denominational school, but a church school. And they said, "Why can't we send our children there?" And I thought that makes sense. I decided to go back and try a religious choice; that was too big of a bite. So I had to take just a choice program and allow parents to put their children into non-religious schools and then eventually we got to religious schools. But it was a terribly tough fight because the unions were against this, organizations were against us and most of the people in the Legislature were opposed to it. CK: You've described Wisconsin as a place where eagles soar and Harleys roar. As governor, you led the first governor's Harley ride. Harley has made a lot of news recently because they have shipped some of their manufacturing out of the country to avoid that steel tariffs that are happening now. What do you think about this? TT: I don't like tariffs and I like the opportunity for companies to be able to trade. And that's what America and Wisconsin need. We cannot survive as a state without national/international trade. So I'm personally opposed to tariffs. But I can understand President Trump trying to get a better deal for America. I liked that in him. But the truth of the matter is that companies have got to be able to do what is best for themselves and their shareholders. CK: What is your secret to being a good politician? TT: First, love people. Be nice to them, be courteous and always try and do the right thing. Be transparent about it, because you have to know what you're doing. And they have to respect what you're doing and you can't do it underhandedly. You've got to do it above board and you've got to tell where you are going and why you're going and why it's important for them to buy into it. CK: How do you deal with the divisiveness of today? TT: The civility in politics has left. I'm hoping that we can get back to that, because I think there are good ideas on both sides and I think the problem is that politics has become a sort of profession of hatred. We try and demonize the other side. And I don't like that. When I was governor, Democrats controlled both the Senate and the House and most of the other elected positions. And I knew I had to work with Democrats. People came out against me when I was on welfare and they'd have marches out there. I'd go out and offer them coffee and bring water out to the gate and say, "Sit down, tell me why you're opposed." Here they'd be carrying a sign against me and they'd ask if they can put down their sign and have a picture with me. My security would go wild about it. But I found the best thing to do was to go and just let people talk. Give people an opportunity. That's what I think is lacking right now — the respect for each other and the opportunity to converse.